This is a list of maintenance tasks & improvements for the Warren Nature Area and surrounding areas. Add a foot bridge to regain access to Wells Park from Gage Boulevard. Remove Amur maple and other trees from the west end of the wetlands, leave cottonwoods and willows. Add "lock box" to wetland drainage box to prevent people from tampering with drain. Small trees & shrubs shall be cleared from the grassland areas south of KNI's campus as well as in the woods along Shunga Creek. Brush in the grassland is being cleared to prepare the sites for seeding with native grasses and forbs. Invasive alien species of woody plants include the following species. The goal is to eliminate these plants from all parts of the nature area. Some native shrubs can become invasive in a grassland. They are controlled by mowing and burning. Some of these plants are desirable as "edge" habitat, but they must be controlled in a grassland. They include the following species. They do provide important habitat for wildlife in the transition zone between grasslands and woodlands. TAS used a grant from the National Audubon Society to purchase native prairie wildflower seeds. These seeds were planted on the north side of the Shunga trail. The City of Topeka prepared the area for planting by removing woody plants and eliminating cool season grasses. The following perennial flowers were seeded. It will take a few years before the plants are mature enough to produce flowers. Bush honeysuckle has invaded all of the woodlands along Shunga Creek. The bush honeysuckle is Amur honeysuckle (Lonicera maackii). Every fall in November, volunteers from the TAS & Kansas Native Plant Society cut and treated with herbicide the bush honeysuckle. It is a very invasive species in Kansas. It replaces native vegetation and reduces habitat for wildlife. The Parks Department uses a brush hog to clear honeysuckle in the woods as well. This occurs during summer. Every October, volunteers of TAS & other organizations collected seed from the Grant-Bradbury native prairie park to be used to restore an area of the park. The park manager for the city, mowed, sprayed and removed trees from the area to be seeded. Volunteers from TAS spread the seed in December each year. 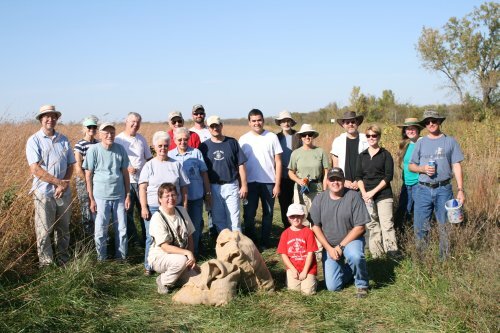 In October, 2010, volunteers of TAS & other organizations collected seed from the Grant-Bradbury native prairie park to be used to restore an area of the park. The park manager for the city, mowed, sprayed and removed trees from the area to be seeded. Volunteers from TAS spread the seed in November of 2010. TAS was awarded a grant of $200 from National Audubon Society to purchase native grass & forb seed to restore more areas to native grassland. Furthermore, native grasses shall be seeded using a native grass drill. Native grasses that are seeded include the following.